An employee adjusts bottles of Bud Light brand beer at an Anheuser-Busch InBev NV facility in Williamsburg, Va. Bud Light is adding prominent nutrition labels to its beer packaging in a bid to tap consumer demand for more information about what’s in food and drinks. The leading U.S. beer brand, which is mired in a protracted sales slump, will begin including standard white nutrition labels on case boxes and six-packs next month, brewer Anheuser-Busch InBev NV said on Friday. Unlike packaged food and other nonalcoholic drinks, the beer industry isn’t required to list calories, saturated fat, sugar, and carbohydrates on its products, though Bud Light lists such information in small type on cans and bottles. 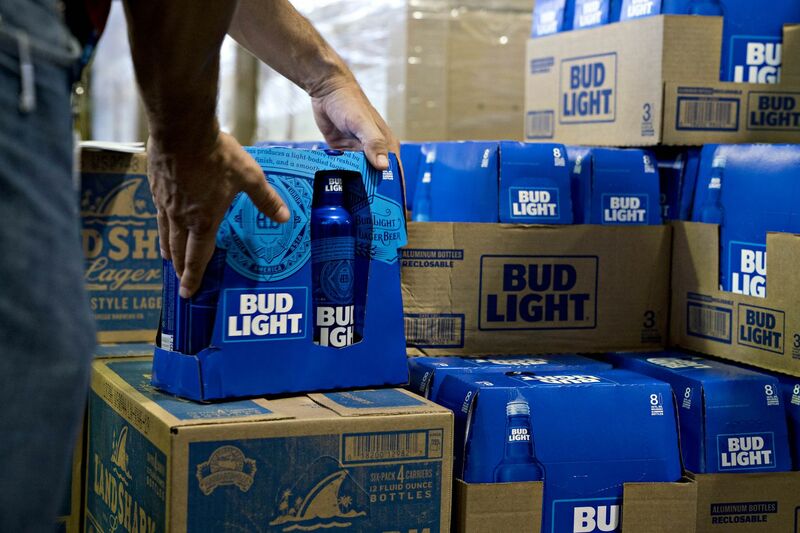 AB InBev is hoping that its new labels, which also tout that Bud Light is made from only four ingredients, will help buoy the brand. "We want to be transparent," said Andy Goeler, vice president of marketing for Bud Light. "It's something they become used to seeing in other categories." Beer consumption has been waning in the United States as consumers switch to wine and spirits or cut down on alcohol. Beer drinkers have been trading up from mass brands like Bud Light and Coors and toward some of the craft options that have proliferated in recent years. Bud Light is by far the biggest beer brand in the U.S., with more than double the sales of second-place Coors Light. Still, Bud Light, which has 110 calories and 6.6 grams of carbs per 12 ounces, has seen its market share slip in recent years. In the five years between 2012 and 2017, Bud Light sales slipped each year, falling 17 percent to $14.5 billion, according to Euromonitor. The new labels will be featured on the beer boxes sold at grocery stores and other locations. In adding calories and nutrition information, the brand appears to be taking a page from a strategy that's worked for its fellow Anheuser-Busch brand Michelob Ultra. Michelob Ultra, which has only 95 calories and 2.6 grams of carbs, has defied the sluggish beer market, with sales jumping more than 80 percent in the three years through 2017. The brand has had success targeting calorie-counting drinkers trying to be healthy even when they unwind, and has hammered home that it is low in carbohydrates. Bud Light plans to run television advertisements to promote its packaging move, including during NFL playoff games this weekend, Goeler said.